The benefits of whole wheat and the dangers of refined flour are old news. It’s important information, but it’s not like anybody who cares about their overall health has not heard it yet. But, there’s more to know about wheat than just understanding that whole grain is better than refined. There are different types of wheat, and recent research has shown that the same benefits that can be had with whole grain can be improved through the use of bulgur wheat. A recent study conducted at the Istanbul Technical University in Turkey looked at the active ingredients in bulgur. Researchers examined the total starch, dietary fiber, phenolic content, and antioxidant capacity of bulgur samples and compared them to other grains. 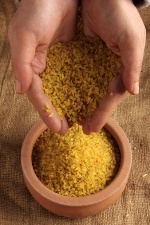 The results showed that total dietary fiber and antioxidant capacity in bulgur are very high. Some antioxidants, which were unique to bulgur, rated very high on the free-scavenging scale. Bulgur is a common ingredient of Middle Eastern cuisine. It is frequently used in pilafs, soups, breads, and stuffing, probably best known in North America as a primary ingredient in tabbouleh. Increasingly, bulgur is being served as a side dish, similar to rice, because it is prepared the same way and can be used in its place. Bulgur is very low in saturated fat, cholesterol, and sodium. It is also a very good source of dietary fiber and manganese. Bulgur wheat can be found in most grocery stores, health food stores, and stores serving the Middle Eastern community. Tacer Caba, Z., et al., “Bioactive healthy components of bulgur,” Int J Food Sci Nutr. March 2012; 63(2): 250-6. Epub Dec. 2, 2011.